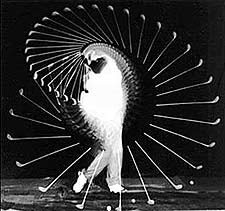 The typical amateur golfer can swing golf club 90 miles an hour or more. When golfers, both amateur and pro alike, swing their clubs out of swing path or out of balance, they put tremendous strain on their joints, muscles, ligaments and tendons. When the force applied to the tissues exceeds their ability to resist the force of the golf swing, they most likely will tear. We call ligament and tendon tears "strains" or "sprains," depending on their severity and whether it is a tendon or ligament injury . Soft-tissue injuries can heal in six to eight weeks, depending on the severity of the injury and the age and fitness of the patient. However, when soft tissue heals, it replaces the injured tissue with less flexible scar tissue, and becomes weaker than before the injury occurred. Scar tissue replaces the original tissue in and around the injury site in an attempt by the body to stabilize the injured joint . Scar tissue is weaker, less elastic and more pain-sensitive than original soft tissue, making it less resistant to further injury. When challenged by the movement of the body, scar tissue will not stretch like the original tissue; instead, they get irritated which results in further inflammation of the joint, which in turn leads to more pain and tenderness and decreased range of motion(joint stiffness). Golf injuries fall under two general categories: acute and chronic. Acute injuries are new injuries, and are usually associated with painful swelling. An acute injury prevents you from playing golf altogether. The first four to six weeks are crucial in the management and treatment of a new joint injury. In addition to pain relief, the goal of treatment is to break down the developing scar tissue in an effort to realign the healing tissue in a way that will lead to proper movement and function of the damaged joint and surrounding tissue, and the prevention of further injury in the future. Failure to treat the injured joint as early as possible may lead to irreversible diminished range of motion of the injured joint. Golfers with acute injuries should follow the RICE format of treatment immediately. REST, ICE, COMPRESS, and ELEVATE. First of all, rest the injured joint. An ice packs should be applied as soon as possible in an effort to reduce painful swelling. The ice should be applied for as long as 20 minutes per hour (20 minutes on and 40 minutes off per hour). Repeat as often as possible during the first 72 hours of an acute injury. To avoid skin irritation, do not apply the ice directly to the skin. Instead, place the ice pack inside a towel before applying to the skin, or apply the ice pack over your shirt. Compress the injury with the ice pack. Compression will assist in the prevention of further joint swelling. Elevate the injured joint above heart level. This step will also assist in keepink the joint swelling to a minimum. Finally, seek professional care. Some Chiropractors, like myself, specialize in specific joint injuries. I have helped numerous golfers over the years with great results. Golfers with chronic injuries, those that have persisted for years, have a unique problem to overcome. Old injuries are often infiltrated with dense binding scar tissue preventing normal joint function and inhibiting normal range of motion within the damaged joint. Chronic injuries are more difficult to work with and typically take a longer time to see results, but these joints can be returned to a close to normal level of functioning. My goal with chronic injuries is to return the joint to a functional level while decreasing joint pain, and reducing the risk of further joint injury. As an avid golfer myself, I know the obsession golf creates. 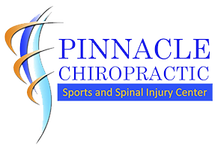 With the help of proper fitness and nutrition, and of course, regular Chiropractic care, I have been able to avoid any golf related injuries. As I continue to live a healthy lifestyle and take care of my body, I look forward to a lifetime of pain free and injury free golf. What else could a golfer ask for?